From Louisa Bay it was a good 60 Nautical miles to Carnarvon. Daylight run if perfect wind, but more likely an overnighter. 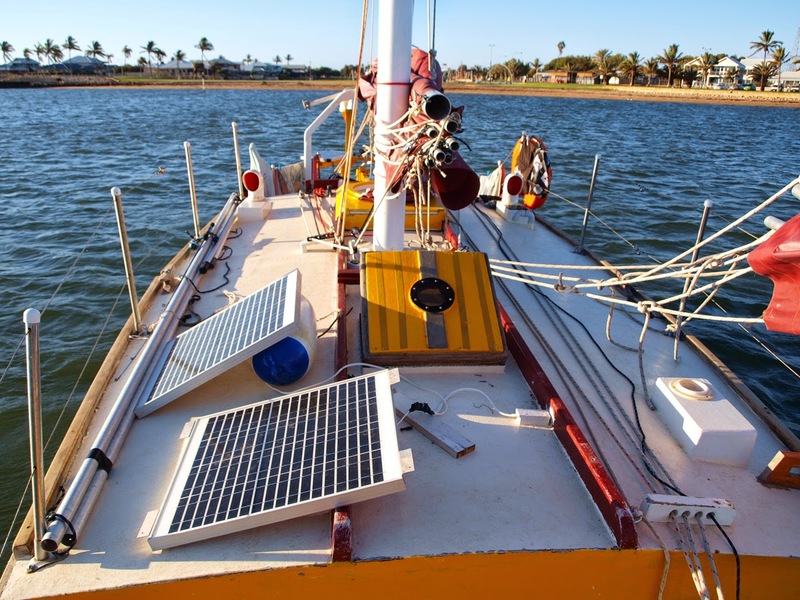 At 11am in perfect weather - standard Shark Bay fare, we set off, raised all 14 panels - standard Shark Bay trim, in a light but good enough breeze to push us 3 to 3.5 knots. Then 2 miles out the wind deserted us. Should we turn back to the anchorage, a 1/2 hour motor away? Or continue on at 1 knot? Not sure how we were doing 1 knot, it wasn’t the current, I looked down at the rudder and eddies were rolling of it indicating we were making weigh. A 4 knot breeze is hard to feel, its like a calm, but obviously the sails notice it. The forecast was for a strong southerly at sunset. 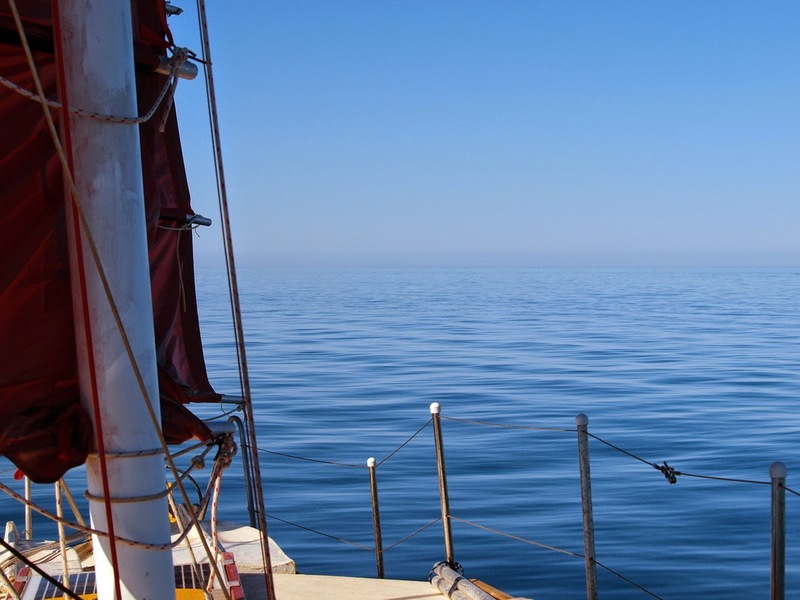 I reasoned there’s no difference sitting at anchor or sitting in a slow boat on flat water. In the end it was 6 hours to do 6 miles, but at least Shark Bay kept us entertained with the antics of its wildlife. At 5pm the southerlies piped up and Ashiki lifted to 4 then 5 knots downwind. An hour later the waves increased too and Ashiki was holding 6 knots, then 6.5 to 6.8 knots the following hour still with most panels up. I kept at the tiller hand steering because we were really making time towards Carnarvon. After 3 hours of high speed surfing placing us 20 miles closer to our destination, I reefed her down and connected the windvane. With only 30 miles to go I calculated we’d reach Carnarvon before sunrise. Guess I was too eager. So reefed to 2 panels on the foresail only, keeping her under 3 knots. Around 11pm lights up ahead separated as we drew nearer, to reveal several vessels, five in fact, which appeared to be moving in a weird random fashion relative to each other. I altered course using the windvane to pass well East of them. It took over an hour to get close enough to figure out what they were. Prawn trawlers and lit up like a football stadium night game. I’ve seen their standard operating procedure a week ago, they zig zag all over the place. One of them appeared to break away from the rest heading eastward out into the inky blackness, into our path. That was annoying, but it took ages to gain on them. I think they were zig zagging in the same northerly direct we were sailing. Thankfully the rogue trawler turned back westward to join his mates. After 2 hours we’d still not drawn level, I raised a couple more panels to speed up the process, satisfied we would pass them by a good margin I went below for some shuteye. By 2am they were still there, only just behind us, these guys were hard to shake. Still needed a slow pace from Ashiki so dropped those panels I had raised earlier and went back to sleep as she resumed her course at 2.5 knots. Some time later, as pre-dawn light was making an appearance, Susie woke me to say the boat is pointing East. That’s not good, shallows and mangrove swamps are in that direction and sailing wildly at right angles to the course is plainly not on! Maybe we’re becalmed. I peeked out the hatch and no, there was definitely wind. A good 15 to 18 knots of it. With the only sail up being 2 panels on the foresail, and sheeted across the boat at 90˚, somehow Ashiki had turned herself 90˚ and assumed a heave to position! Took awhile for her to respond to the tiller to get her point downwind again, helps to have steerage for the rudder to work! It’s always with some expectation and a little excitement when approaching a destination we hadn’t sailed to before. We love it. There were channel markers a few miles infront of us, somewhere, and who knows when they’ll become visible. I saw a pylon a long way ahead but slightly to port, and thought that was it, but no, that belonged to the mile long jetty further up the coast. We could see buildings on land in the distance ahead, it was Carnarvon alright. So no matter what, we were to hold the 57-58˚ (compass) course till something shows itself. Susie usually spots pylons and markers first, and this time was no exception. They were dead ahead, so I must have got that leeway figured correctly! It was like spotting a needle protruding from the top of a haystack at 500 hundred paces. Here we were, in Carnarvon, hub of the Gascoyne region, only 80 miles south of the Tropic of Capricorn. Not only a new climatic zone, the white sandy terrain is gone, it’s red soil all round. A result of being in a river delta, the dirt is from a 1,000km inland. We made it to the "North West”.